Blocks and Files Let's think about putting some storage Lego bricks together in a new combination. The bricks are labelled NetApp, DataONTAP, ONTAP EDGE, VSA, VMware and Hyper-V.
A VSA is a virtual storage appliance - with storage array controller software running as a virtual machine and turning the host server's local disks into a shared storage facility, a virtual SAN. 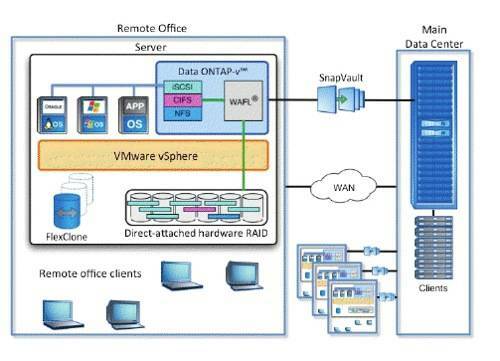 NetApp has crafted a version of Data ONTAP, its FAS array operating system, called ONTAP Edge, and this is a VSA running under VMware which NetApp positions as a remote office facility. It's also completely in tune with the software-defined storage idea. Edge runs ONTAP-V and has native dedupe, FlexClone, SnapVault, SnapRestore and SnapMirror software so the remote office can be backed up from a central data centre. It also has virtual volumes management system FlexVols. NetApp image: ONTAP Edge schematic. There are two obvious ways we can go from here. One is to head towards the data centre and make Edge more capable - give it clustering and high availability for example, and enable it to use server flash as a cache to speed things up: so that it becomes a sort of Edge FlashCache. Another thing to do would be to give it Hyper-V support. Oz colleague Simon Sharwood heard from Val Bercovici in NetApp's CTO office that NetApp is working to make BSD Unix a better Hyper-V guest. ONTAP is based on BSD. Here's the leap: let's put ONTAP Edge into Hyper-V giving it - and hence Windows Server - a NetApp VSA. This could have FlexPod effects as Hyper-V is used in some FlexPod/ExpressPod configurations and an ONTAP VSA in FlexPods would enable lower cost configurations - particularly attractive in lower-cost ExpressPod land, branch office ExpressPods for example. We understand ExpressPods that are using Hyper-V and, separately at present, ONTAP Edge, will be available later this year. A Hyper-V version of ONTAP Edge could take advantage of NetApp's SnapManager for Hyper-V. It would also provide a hedge against VMware's own VSA ambitions; witness its Virsto acquisition.